This week, the Internet was aflame with criticism of the Mattel Barbie book I Can Be a Computer Engineer. In theory, the text should have been a wild success. Barbie plays the part of a computer engineer, a field in which women are severely underrepresented. In practice, it all went horribly wrong. 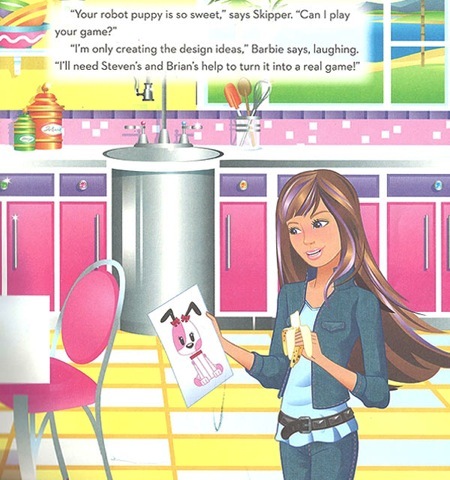 Instead of reading about Barbie&apos;s successes in the land of computer engineering, readers were presented with a character who required a man&apos;s help in order to actually do any coding. "I&apos;m only creating the design ideas," Barbie says, laughing. "I&apos;ll need Steven&apos;s and Brian&apos;s help to turn it into a real game!" Predictably, the Internet went nuts. The original source for the outrage was screenwriter Pamela Ribon, who wrote a fantastic and detailed takedown of the poorly thought-out book. Her headline says it all: "Barbie Fucks It Up Again." Though the Internet and the media only recently got hold of Computer Engineer Barbie, the doll and the book have actually been around for quite some time — the Amazon reviews, for example, go back almost a year. There&apos;s also a petition currently in the works asking Mattel to rewrite the books: "We have to take a stance against Mattel&apos;s sexism because Barbie&apos;s story reinforced all the clichés women in the tech industry face everyday: Men get all the work done, men are better, men do the important stuff. Tell Mattel to let go its out-dated, irrational and sexist image of femininity and rewrite engineer Barbie&apos;s story." We&apos;ve contacted Mattel for comment, and will update this story if we receive a response.